The USM 69 i condenser stereo microphone is a studio microphone for intensity stereo recording. It is suitable for XY and MS recordings. The USM 69 i stereo microphone has two separate dual-diaphragm capsules. These are mounted vertically and rotate against each other. The directional polar patterns can be selected separately for each capsule. The capsules operate independently from each other. The microphone consists of the amplifier section and the capsule head. The amplifier section contains two microphone amplifiers operating independently from each other. They have an extremely low self noise. Two completely separate microphone capsules are positioned closely above each other within the capsule head. Their diaphragms are made out of gold-sputtered polyester film. The upper capsule rotates against the lower one over a range of 270°. Color markings on the lower capsule system help to identify the angle by which the upper capsule has been rotated. When sound waves reach the microphone capsules from different directions they will generate audio signals with different intensity only, but not with time differences, since the capsules are in close proximity and the sound arrives at both capsules simultaneously. The result is an intensity stereo signal that can be summed together for excellent mono compatibility without causing interference. The USM 69 i has two built-in rotary switches. The five polar patterns of both capsules can be selected at the microphone itself. Therefore, no special AC power supply units or powering adapters are necessary. The two outputs attach directly to any 48 V phantom powered connectors. In addition to the usual polar patterns: omnidirectional, cardioid, and figure-8, we have added a hypercardioid and a wide-angle cardioid pattern. A built-in DC converter generates the required capsule polarizing voltages. The amplifiers feature high output capability and extremely low self noise. Distant sound sources, as well as very loud sound sources at close range can therefore be recorded without any problem. Each amplifier has an active filter. It effectively suppresses subsonic interference as caused by wind or structure borne noise. At the same time, the filter prevents the output transformers from overloading through very low frequency energy. The microphones may also be used as completely independent mono microphones. 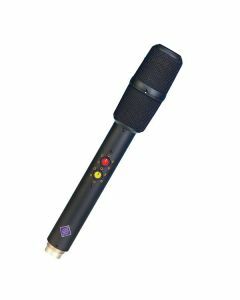 There are many applications when it is important to have a second mono microphone as a backup, or when the outputs of microphones with different polar response characteristics must be available simultaneously. The outputs of the two microphone channels can be linked (cascaded). In addition to the individual directional patterns, other characteristics are available through the combination of both channels. Both microphone systems operate completely independent from each other. The second amplifier will be unaffected, even in case of a faulty ground of the supply voltage for one of the channels, or a short circuit in one of the outputs. The microphone is reliable in mono usage, even if only one of the systems is operated and connected. Its simple and redundant circuitry guarantees a low failure rate. Should the DC converter ever fail, a diode circuit within the microphone ensures that both systems will remain operational. The cardioid pattern is automatically chosen. The sensitivity is reduced by 3 dB.